On October 17 2018, Tagtoo will be launching Tagtoo Dynamic Product Ads Platform, presenting the hands-on experience of 8 years on digital advertising, and debunking the popular myths on choosing online marketplaces exclusively with e2eCommerce participants. Tagtoo Dynamic Product Ads Platform, also known as Tagtoo DPA platform, is the total solution of digital advertising for e-commerce to spend budget more wisely. The proprietary technology allows advertisers to automatically make beautiful and amazing dynamic banners on all major media platforms in just 10 minutes, as compared to 3-5 days in most cases. “In the e-commerce scene, it’s either make it or break it, which is especially true in Indonesia. 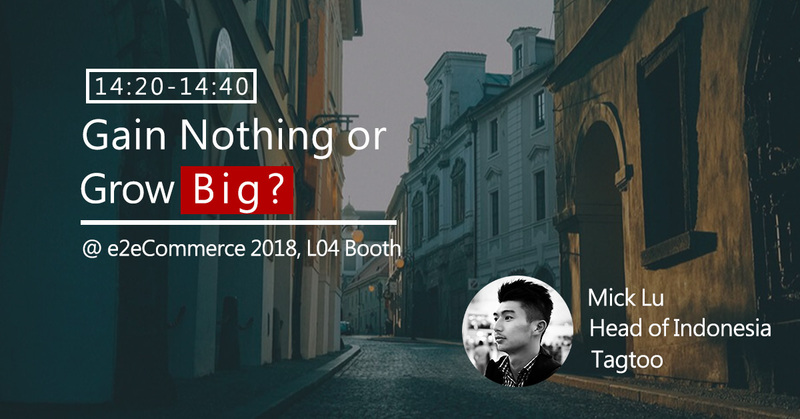 Only when entrepreneurs have a comprehensive understanding and practical approaches can entrepreneurs become the remaining winner in the battlefield,” shared Mick Lu, Head of Indonesia, Tagtoo, who will deliver a keynote speech and share more secret recipes for e-commerce growth. “Making the right judgement call with right technology is the key. You need to be smart and fast to catch up the world trend. Thereby, we are humble and honored to introduce Tagtoo DPA Platform to Indonesia,” Mick Lu continued. Below are the key points and common dilemmas for e-commerce entrepreneurs that Mick Lu will go through on stage. In addition, he will offer more detailed explanations with corresponding answers to each scenario. Consequently, entrepreneurs of SMEs who just start their first few advertising campaigns tend to have a misunderstanding about digital marketing. They expect substantial results and significant changes in their business immediately, which is unrealistic in practices. Moreover, most of the advertising agencies in Indonesia offer a wide variety of, but superficial, solutions, meaning business can enjoy delivering ads on all existing channels but the package offered actually favors agencies and is not flexibly customizable. For example, advertising performance is unstable and often is not guaranteed. Not transparent advertising reports, i.e. Google Analytics, provided is commonly encountered as well. Most importantly, high entry barrier of using Dynamic Product Ads (DPA), an ad format that’s proven efficient to drive online sales, and incomplete support from agencies make it even harder for advertisers, especially SMEs, to embrace the real power of digital advertising. Indonesian younger generations increasingly find Facebook old-fashioned and, therefore, shift to Instagram nowadays. Entrepreneurs and marketers, consequently, tend to hold a negative perspective toward Facebook Ads and think allocating more budget to Instagram is the best cost-effective approach. According to Statista, a prestigious statistics portal, Facebook was ranked as the second leading social network with 41% penetration rate as compared to Instagram, which was the fourth, in the the social network penetration in Indonesia in 3rd quarter 2017. Given the characteristic of Instagram, entrepreneurs should use this picture-based social platform to engage with potential customers and adopt Facebook as a supplement to drive additional online sales and acquire more transactions. Both channels, Facebook and Instagram, are equally beneficial to marketing campaigns. Each platform has its irreplaceable role in boosting sales. Under no circumstance should entrepreneurs focus on a single platform only. As a merchant, choosing online marketplaces as the first stop to sell products is an intuitive decision. The easy-to-use and well-organized functions, such as payment systems and logistics delivery, make online marketplaces appealing and irresistible to most entrepreneurs. While online marketplaces seem to be providing tremendous convenience and possessing a huge customer base, little do many figure out is that starting at online marketplaces is not an one-size-fit-all approach. They might not be the best place to start if entrepreneurs’ long terms goal is to grow big. Generally, entrepreneurs will be faced with 3 difficulties: price competition, data collection, scalability, which is seldom mentioned and is a critical issue for business development in the long run. Take price competition for example. Online marketplaces rely on product categorization to help potential customers quickly discover what they are looking for. This mechanism, however, makes seller’s products experience price comparison with similar substitutes in every item search. This fierce battle in online marketplace never shows a sign of stop as more Chinese manufacturers jumping into, which is widely observed in Indonesia. It is almost impossible to compete with China-manufactured products in terms of price. Their huge scale of productivity can easily beat any micro or small sellers down with lower price but the same, perhaps better, quality. “launching online shops on marketplaces is suited to beginners or for testing purpose prior to soft launch. When it comes to running a sustainable business, online marketplaces shouldn’t be your priority,” stressed Mick Lu. Tagtoo strongly believes Indonesia e-commerce should be served with better services and products. SMEs, most are underserved in term of marketing planning and digital advertising, should likewise have the equal right to experience the unprecedented convenience brought by digital advertising. In collaboration with Cocowork and UnionSPACE, two of the leading co-working space provider in Indonesia, Tagtoo has helped over 100 startups and 500+ Indonesian entrepreneurs embrace the real power of digital marketing by launching intense training workshops and hosting e-commerce seminar with Google and Facebook speakers. From the general introduction of digital marketing to the advanced methodology of driving transactions, Tagtoo will continue presenting Indonesian entrepreneurs community with the top-notch digital marketing knowledge and, hopefully, significantly shortening the gap of the business landscape in Indonesia. Tagtoo’s mission is to empower entrepreneurs with the right tools, such as Tagtoo DPA platform, and correct knowledge to build a sustainable e-commerce business and grow their companies. Everything we do, whether online free consultation on digital marketing to offline training workshop and seminar, goes back to our core. This mission is our boss, and on account of this, we are committed to helping more aspirational entrepreneurs to change the Indonesian e-commerce scene. Tagtoo, founded in 2011, is a performance marketing company that's based in Taiwan and has offices in Malaysia and Indonesia. We specialize in managing Facebook, Google AdWords and other portals for clients with data-driven strategies and proprietary technology.